Are you tired of hearing your kids ask the question, "How many days until ___?" 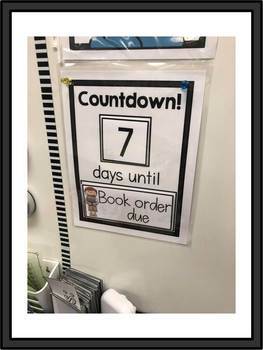 Eliminate that question with this fun countdown board! Simply print and laminate the board (6 color options included!) that you like as well as the number and special event cards. Place a piece of Velcro in the middle of the square and rectangle on the board. Place opposing pieces of Velcro on each number and special event cards. Choose a special event and a number of days and add them to your board! Kids will love watching the countdown! 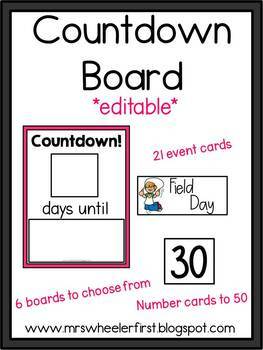 *There are editable cards included so you can make countdown cards with events specific to your classroom/school. Have something in mind that is not included? Simply leave me a question on my TpT page or email me at meganwheeler44@yahoo.com with your suggestion!